Marival Resorts on Mexico’s west coast have always been known for their extensive, all-inclusive amenities and friendly, authentic service. Now, they are taking it up a notch. Introducing, the upgraded Marival Emotions Resort & Suites and Marival Distinct Luxury Residences, where families can customize their stay from beginning to end. And, Marival is proud to present the all-new Marival Armony Luxury Resort & Suites, offering guests a unique fusion between nature and luxury. Delta Vacations gives you more ways to rack up miles, and earn toward your Medallion® Status. SkyMiles® Members earn 2,000 bonus miles per person, in addition to credited flight miles, with a flight and Marival Resorts package. 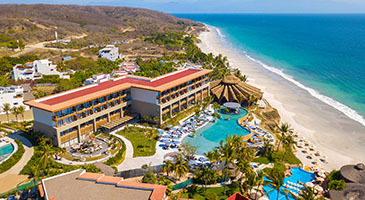 *Sample Pricing: This offer is available from hundreds of origin cities, but this price, which reflects the offer, is based on travel between Atlanta and Puerto Vallarta, staying at Marival Emotions Resorts & Suites in Riviera Nayarit. Price is per person, based on triple occupancy and select Sunday departures and Friday returns, July 14 – 19, 2019, and is subject to change. Additional restrictions and baggage charges may apply. See Terms and Conditions for details. 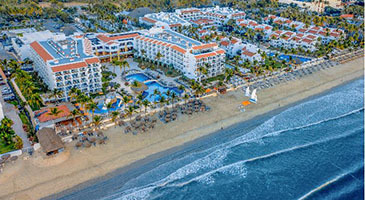 As pioneers of making guests feel at home, Marival Resorts in Riviera Nayarit, Mexico, are distinguished by authentic and friendly service, which is reflected in the loyalty of guests who have been returning to these resorts continuously for generations. Marival Emotions is perfectly designed for families, with fun activities throughout the day and nightly entertainment for children and adults. It is a dynamic place with great vitality, where experiences pass from generation to generation, creating communities of friends. The resort’s outgoing and energetic activity team offers guests multiple entertainment options to turn moments into unique experiences. Marival Distinct is defined as a luxurious resort, with outstanding and personalized service focused on each guest’s necessities. It has become a fashionable spot, thanks to its exclusive social events and the distinguished personalities who visit. 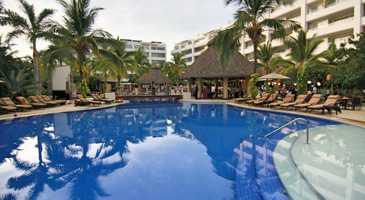 From families to groups of friends, this resort is a favorite spot for sophisticated travelers. Marival Armony fuses the incomparable beaches of the north bay with the elegance of a first-class resort — the perfect balance between luxurious comfort and nature in Punta de Mita. This resort was designed for the vacationer who has a lifestyle focused on wellness, tranquility and a connection with nature. The service offered here is personalized, with attention to guests’ needs that goes beyond the ordinary. *Price is per person, based on triple occupancy at Marival Emotions Resorts & Suites in Riviera Nayarit, between Atlanta and Puerto Vallarta. Sunday departures and Friday returns via nonstop service on Delta and certain Delta codeshare partners and is valid for specific travel dates July 14 – 19, 2019. Advance purchase requirements vary. Other travel days and dates and accommodations are available at other prices. May require travel on specific flights or times; blackout dates may apply. Enter promotional code MARIVAL19 in the Promo Code/eCertificate box on the Booking page. Up to three kids, 12 years old and younger, stay and eat free when sharing a room with paying adults. Offer valid at Marival Emotions Resort & Suites and Marival Distinct Luxury Residences. Book and travel by December 16, 2019. Receive a free upgrade to Family Emotion amenities, including a welcome basket of healthy and sweet snacks, plus cool welcome treats stocked in the fridge for arrival; bundle of beach toys, pool toys and vacation essentials; and more. Book and travel through December 31, 2019. Valid for Marival Emotions Resort & Suites and Marival Distinct Luxury Residences properties only. Book now, for travel through December 15, 2019.